Laura is a “counseling” lamp who is helping me to find myself and to understand where I want to go. For her great help, I wanted to give her a present that represents the work we are doing. The inspiration came from the need to find my street, and not get lost in the various paths that life presents you. From this, I have devised a “compass / lamp” that, in addition to helping you keep the “direction,” illuminates the path. The “compass” does not have cardinal points, because the “right” direction, you have to decide for yourself! She tells you only if you’re following the path that you have chosen. By turning the lamp, you change color by giving different emotions each time. If for some reason you stop, you can activate the “rainbow” cycle, a continuous series of color shades of red, blue, and green. The electronic construction is very simple; Arduino, LED Neopixel matrix, magnetometer, and a switch. 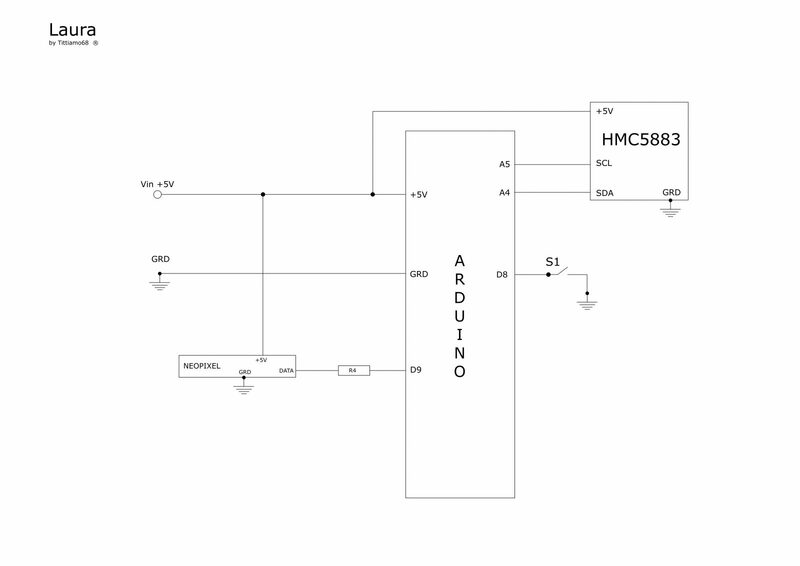 The magnetometer (HMC5883) connected to the Arduino pin A4 and A5 (Protocol I2c), through the “Adafruit_HMC5883_U.h” library, provides the magnetic intensity of the xy axes. The formula headingyx = atan2 (event.magnetic.x, event .magnetic.y) provides the angle of declination. The Neopixel LED, connected to pin 9, lights up in a different color, depending on the angle of declination. The switch, connected to pin 8, using the internal pull-up, allows the lamp to change program type (Compass – Rainbow). The hardest part for me was to build the lamp box. The base is a box made of plywood, while the shell is made of opal plexiglass square, glued with cyanoacrylate. For more portability I also added a “Power Bank” battery for mobile phones.